We understand that visiting the vet can create stress for your pet. Here are our top tips for ensuring that your next trip to see us is as happy and calm as possible. Plan your journey carefully so it suits your pet’s needs. “Dogs and puppies can be walked to and from the practice if possible. It’s a good way to help your dog associate something he enjoys (a walk and time spent with you) with going to the surgery,” advises Inga MacKellar, an APBC animal behaviourist. If walking isn’t possible, safely restrain your dog in the car using their familiar dog crate (or smaller carrier for pups), or with a car harness with lead. Secure car carriers are also needed for cats. All carriers should be securely restrained in the car to stop them from moving around or hitting passengers. If you are travelling by car, it can help to get your pet used to the car crate or carrier well before the day of the appointment. Puppies can benefit from a daily car journey to make the trip to the vet less stressful. “Cats rarely venture out of their familiar territory, so the mere sight of a carrier can ring alarm bells and make your cat head for the cat flap,” says Inga. Keep the carrier out permanently, so it's your pet's familiar safe den, or at least for several days before your appointment and make it cosy with some of their bedding. Let kittens and puppies play, sleep and have the odd treat in their carrier. You could try shutting the top briefly once they have become accustomed to their portable hideaway. If you can, hold off on your pet’s regular feeding before you go. Anxiety can make animals want to empty their bladder and bowels more frequently, and an empty stomach will also reduce the risk of being sick in the car. A top opening carrier, preferably with optional opening flaps on the side, is recommended for cats and smaller pets such as rabbits, ferrets and degus. “It’s far less stressful to be gently lifted from above than being dragged out of the narrow opening of traditional tunnel-shaped carrier,” says Inga. “Keep your cat’s or rabbit's carrier covered with a towel or blanket at all times, as she needs to feel hidden to feel safer.” A puppy may feel calmer with the carrier half covered and with lots of reassuring words from you. Small pets such as mice, gerbils, hamsters, guinea pigs and rabbits are best transported in a rigid, well-ventilated, top opening box that can’t be chewed for an escape route or made too soggy with urine. Scent is essential to these pets so place plenty of their own used bedding in the box. Rabbits hate being solo so take their co-bunny too for comfort and security, along with plenty of hay to keep nibbling. To transport your reptile or exotic pet, use a dark well-ventilated box, or a bag for snakes, and make sure it’s secure so they can’t escape or be injured in the move. Make sure you use an appropriate heat source as well so they don’t get too cold. Keeping claws trimmed makes handling easier and remember to take a familiar towel if your pet needs to be handled during the appointment. The waiting room is not the place to let other owners take a peep at your nervous cat, or timid rabbit. It’s best to sit as far away as possible from different species and other dogs. Some dogs and puppies can feel threatened by a boisterous, barking dog, or by another dog staring at them. “It’s possible for dogs to sense other pets’ fear, which can increase their own anxiety,” says Inga. “Reduce waiting time stress by asking if the receptionist will give you a ring when it’s your turn so you can walk around outside with your dog, or keep your cat or dog in the car until it’s their appointment time,” advises Inga. Also take your pet out of the surgery as soon as possible after the appointment. Some veterinary surgeries have separate waiting areas for cats and small animals, away from dogs, which can help your pet be less stressed. “Try using some simple stress relievers, such as a synthetic dog or cat pheromone spray, spritzed into your pet’s carrier or crate half an hour before you leave,” Inga suggests. A ThunderShirt, a coat especially designed to apply gentle pressure to a cat or dog’s torso, may help relieve anxiety, but don’t try it on the day of the vet’s visit. Your pet needs to be accustomed to it and happy to wear it first. 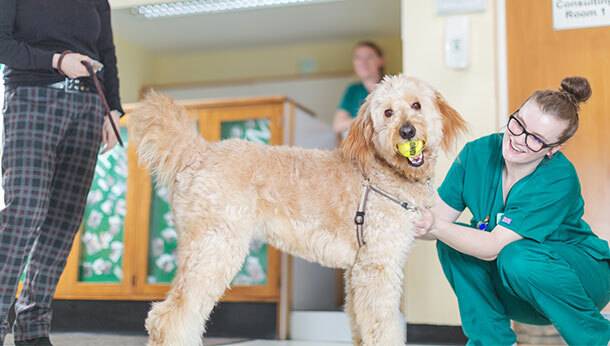 Pack suitable treats or favourite squeaky toy, for your pet as a reward once the vet has examined them. They can also be used as a distraction when things get tense.